In a world of microservices development and Docker-based deployments, RESTful web services tend to grab all of the headlines. And while the design of RESTful APIs can be a challenge, modern frameworks like Spring Boot and JAX-RS make RESTful web services incredibly easy to develop. As such, their proliferation comes as no surprise. But we've made great strides in the world of JAX-WS (Java API for XML Web Services), and modern SOAP (Simple Object Access Protocol) web services development is no longer the arduous task it once was. In this step-by-step SOAP web services example in Java using Eclipse, we will demonstrate just how easy it is to develop and test a web service based in JAX-WS. The simplicity might surprise you. In fact, this SOAP web services tutorial might even convince you to give up on your RESTful APIs for good. In a recently published Spring Boot RESTful web services tutorial, we implemented a microservice that keeps track of the number of wins, losses and ties in an online game of rock-paper-scissors. In this SOAP web services example in Java using Eclipse, I would like to implement the exact same use case, only with JAX-WS instead of JAX-RS. The first step is simply to create a dynamic web project in Eclipse named soap-ws-example. The project should use web module version 3.1, employ a minimal configuration and be associated with a runtime that supports the Java web profile. 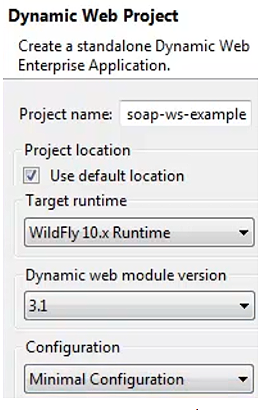 For this SOAP web services example in Java using Eclipse, we will employ WildFly 10.x as the chosen runtime. This SOAP web services example will use two classes: a simple POJO (Plain Old Java Object) named Score and a class that mitigates remote access to the Score class named ScoreService. We will keep the Score class incredibly simple. The class will declare only three public variables, each of type int, named wins, losses and ties. To really keep things tight, we won't even add any setters or getters. Decorate the class with these annotations. The ScoreService class will mitigate access to the Score class through methods such as getScore(), increaseWins() and getLosses(). Initialize the instance of the Score class the ScoreService references through dependency injection, or read from a NoSQL database, as a web service should never maintain any internal state. But to keep this SOAP web services example in Java using Eclipse as simple as possible, we will cheat a little and simply make the Score instance static. This will work when the SOAP web services example is tested on a single Java virtual machine. Just keep in mind that such an approach would fail in a distributed environment. The SOAP web service needs two annotations. Add an updateScore method to the SOAP web service. Next, we will add a reset method. This sets the number of wins, losses and ties to nil. The method in the class will be named reset, but when SOAP web services clients invoke the method, we want the remote API call to be resetScore. To override the default method to Web Services Description Language (WSDL) mappings, JAX-WS provides a special annotation called @WebMethod. By changing the operationName attribute of the @WebMethod annotation, the method name used by the SOAP web services client can be tweaked. Override the default method and provide a special annotation. With the Score and the ScoreService classes completed, simply right-click on the soap-ws-example project, and select Run As > Run on Server. How to run the SOAP web services example on WildFly. As the SOAP web services example starts, look in the console output of the server for a reference to a WSDL file. As the web container processes the @WebService annotation, it will create a WSDL file that describes the service's remote API. Note the location of the WSDL file. Note the WSDL file creation and identification. Once you know the location of the WSDL file, open Eclipse's Web Services Explorer, and browse to the file. This will then open a web-based SOAP client that can you can use to invoke all of the public methods of the web service. How to use the Web Services Explorer in Eclipse to test SOAP web services. In the past, years before the release of the EJB 3.0 specification and the introduction of the @WebService annotation, the creation of a SOAP-based web service meant writing WSDL files. This was arduous work with XML parsing libraries and a fight with SOAP envelopes. But today, using popular frameworks and a modern IDE, web services development is extremely simple, as this SOAP web services example in Java using Eclipse demonstrates. The Java source code used in this SOAP web services example in Java can be found on GitHub. Which type of Java-based web service development do you find easier: JAX-RS or JAX-WS? Along with XML Parser I can try this as well and I think it's a great option. Thank you so much, this is precisely what i was looking for...Thanks once again!